My kids love building forts. Like every. single. day. They never get tired of it. I even had to put a ban on fort building a little while back because their forts were getting massive and out of hand and messy. I know I'm such a party-pooper mom! Several years ago for Christmas Jeanine gifted our family some fort kits that she put together with sheets, clothes pins, and glow sticks. These kits have been the best! I mean really awesome. With the rate that my kids build forts these kits have been a life saver. It's so nice to have a bunch of large sheets that the kids can do whatever they want with and then when they're done they can just fold them up and put them back it the fort bag--and I don't have to worry about having to wash the sheets because they're going to go on someones bed the next day. Not too long ago I was chatting with some moms and fort building came up. The fact that building forts creates a mess of blankets and sheets is never fun for a mom. 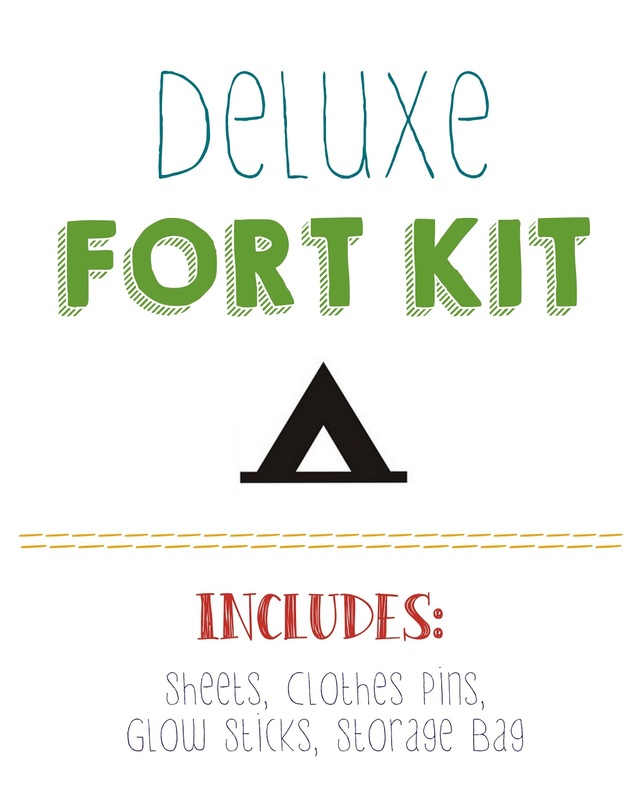 I shared with them about our fort kits and they all loved the idea. A few months ago I spied these cute sheets at Target for an incredible price and thought, "Those look like really cute fort building sheets." I grabbed a couple sets and made some fort kits for my sister-in-law and her family for Christmas this last year. I love that the sheets come in their own little bag--it's perfect for packing and storing all the fort kit supplies. I sewed some ribbon onto the sheets at each corner and then also at the center points of each edge. This way the sheets can be tied to chairs, bed posts, railings--whatever's convenient for making your fort. I used a lit match to seal the ends of each of the ribbons so they won't fray. Sheets complete with ribbons for tying, clothes pins for connecting blankets/sheets together (sometimes my kids like to clip them to the inside "roof" of their fort and pretend they're bats) and glow sticks for lighting up a dark fort = the perfect combination. I also created some little tags to attach to the fort kit bags to give the kit a finished look. Do you have fort builders at your house? I love to hear about the messiest fort your kids have made! Feel free to copy and print my fort kit tags below.